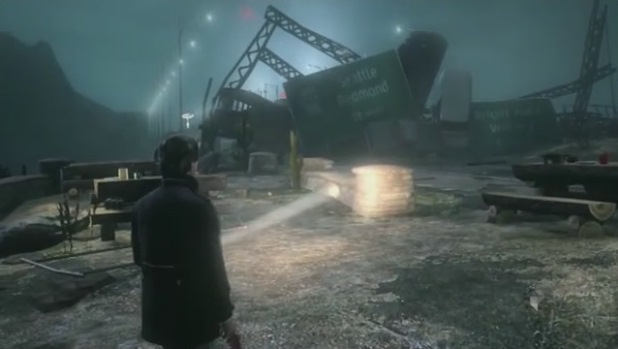 Remedy Entertainment’s 2010 game Alan Wake proved that a flashlight could be quite a weapon, as beleaguered writer Alan Wake had to resort to it to kill powerful undead enemies known as the Taken. The Taken, you see, had shields that Alan Wake had to destroy (by shining a light at them) before he could put down these pesky undead with a bullet or two. And this was certainly a quite original gameplay idea back in 2010. The game was originally released for the Xbox 360, and later a PC version followed. It was a third-person action game, which told the story of writer Alan Wake, who visits the town of Bright Falls with his wife hoping to enjoy a relaxing vacation in a cabin in the middle of a quiet lake. But the town is besieged by supernatural forces, and Wake is separated from his wife and must free Bright Falls from the forces of darkness. The game had an atmosphere you could cut with a knife, and intense battles with The Taken were punctuated by quiet moments in which Alan Wake found refuge in sources of light such as lampposts, and read pages of a novel he did not remember writing. Alan Wake sold a respectable 4.5 million copies, and given its rather ambiguous ending, many gamers expected a sequel to be released sometime in the future. And developer Remedy Entertainment also had this idea in mind, as they had actually created a concept video (see below) to pitch the game to publishers, as the team revealed in an interview with Polygon. But it is clear that the project never got off the launch pad. Remedy went on to release another, much smaller scale Alan Wake game (Alan Wake’s American Nightmare) which featured some of the ideas seen in the prototype video, but an Alan Wake sequel never saw the light of day. And Remedy ended up working on Quantum Break, another third person game which will be released exclusively for the Xbox One in 2016. But Remedy’s release of the prototype video suggests it is very likely that we’ll eventually see writer Alan Wake fighting undead in another game in the future. This makes sense considering that Remedy owns the rights to the Alan Wake franchise, and their release of the Alan Wake 2 video suggests that the team has interest in creating another Alan Wake game. And if their upcoming game Quantum Break turns out to be a success (and given Remedy’s track record that is very likely), then it will be easier for them to convince a publisher like Microsoft to greenlight the project. In the Polygon interview, Remedy’s creative director Sam Lake said that he regretted killing almost all the characters in their earlier game Max Payne, and that it pays to plan for a sequel. What is ironic is that gamers got to play Max Payne 2, but despite Remedy’s planning ahead for a sequel, Alan Wake has not had a sequel released for it yet. And given that the original Alan Wake was such an entertaining and atmospheric game, here’s hoping that gamers get to enjoy more of writer Alan Wake’s adventures in the future.